Out my window I see The Sydney Harbour Bridge as a graceful arching backdrop behind the happily bustling 'stages' of Circular Quay, The Rocks and The MCA. I know the area is considered touristy by many self respecting Sydneysiders but I personally cannot stay away. There's something about riding the City Circle and stopping at Circular Quay that makes all my senses anticipate adventure. My fascination with the area really took off when Master SSG went free range and ditched his stroller. His fascination with trains and his encyclopedic knowledge of the metropolitan NSW train network has seen us spend many a weekend and public holiday traveling around Sydney by rail. The City Circle is his favourite part of the network. As our lives become increasingly hectic with school, activities and work - these train-centric expeditions around and in our city have become even more special to us both. Not only for the sights, sounds and experiences they afford us but also that precious time when we can just spend time together just being rather than frantically doing. Everything seems larger than life and I've taken to walking Circular Quay with my head permanently tilted upward to see who's guest starring across the iconic skyline of the harbour this week. An afternoon at Circular Quay is a case of pretty much choosing your own adventure. You can walk up to the Opera House forecourt and explore it and its views if you wish. Or else you could travel onward via ferry to the zoo, the beach or elsewhere. 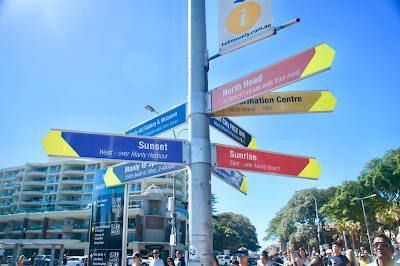 If you choose to turn left as you leave Circular Quay train station, you can wonder around the MCA or just grab a bench and sit for awhile, feeling the sun on your arms and legs and watching the world go by. Last weekend, we took a right turn to Wharf 2 where we boarded the Manly Fast Ferry. It's a 25 minute express service without any stops along the way. Being Sunday and sunny at that, everyone on board was in good spirits. We zipped out of the quay and past Rushcutter's Bay and then a few other bays of the east before heading for Manly Beach. 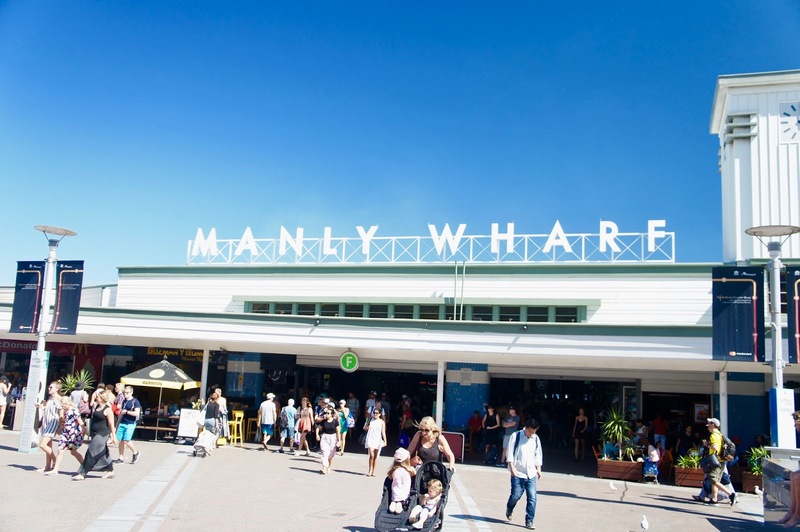 Where we were greeted with by my old friend Max Brenner at the Manly Wharf food court. We were spoiled for choice with regards to afternoon tea. Master SSG was having a look at the fresh fruit juices as he waited for his strawberry smoothie to be made. There was no time to waste popping into Aldi (I can't believe I said that). It wasn't as crowded as Bondi often gets and the beach just had a lovely energy about it. Family groups, tourists, locals and couples. There was enough room for everyone. If the beach wasn't your thing, the bar overlooking it looked to be a good Plan B.
I'm a sucker for spotting those giant inflatable pool floaties / lounges. The pink flamingos also happen to be my favourite. We felt the sand between our toes and the water lap at our ankles. And we just sat and gazed for a bit as well. It came time to head for home all too soon. But at least we were commuting on the water as opposed to battling the Sunday afternoon traffic. What's the view like out your window today? We didn't get time to go to Manly beach with the boys when we were last in Sydney and it's a shame as I've been before and it's just as nice as your photos make it look! These are really lovely photos too, such a nice way to spend a day out. I absolutely love Manly and go there often! And my son used to be a fan of trains too although our station of choice used to be Central where there were always loads of train coming and goings to be observed! I actually used to take a picnic lunch there and sit on the platform with him whilst he got his fill of trains - lol! Thank you SSG for showing photos of my beloved Sydney. I realised I have lived in Brisbane, 30 years this year so exactly the same amount of time as in Sydney where I was born. My bucket list is departing and arriving through the harbour on a cruise. We used to catch the bus to Circular Quay and take the ferry to Manly and back every school holidays so I have been on the harbour but a cruise ship would top it off. Have a great week! I love that your little one loves trains and you spend time on them adventuring. You're right, travel like that, even within your own city or town, give you space to just be with each other. And what an amazing day this looked to be! Beautiful. I like your window ... Great views from your "windows to the soul". What a most exceelent adventure! 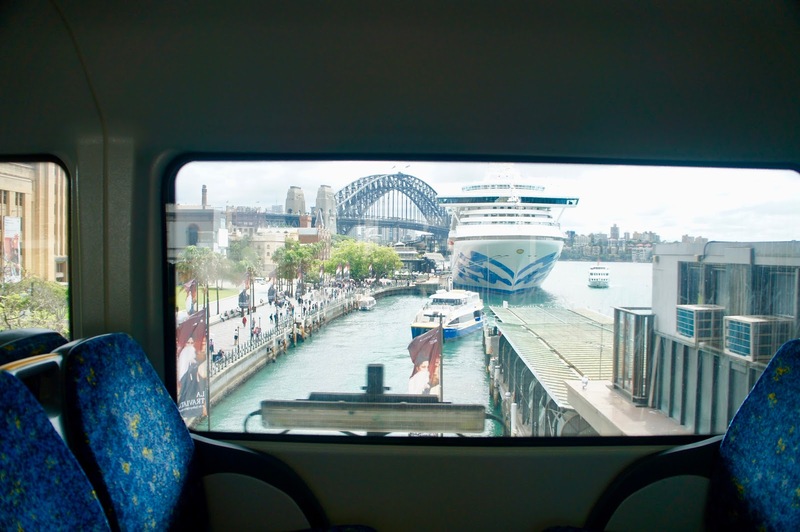 I share your love of Circular Quay and City Circle. As a youngster I travelled that route in school holidays on my way to the museum, art gallery and anywhere else that took my fancy in the city. It may be touristy but there is always an air of anticpation and excitement which is contagious! Well that certainly made the view out of my window look a little dismal! Glad you had such a fabulous time - I'm a little envious! Ah a nice little tour of Sydney's hot spots! :) I must admit I always love seeing the bridge! I miss Banh Mi so much! I haven't really found a good substitute over here. I mean, at least not with the right bread. And the bread is one of the best parts!